With all the action in the Big Brother 2014 house these past couple days, Saturday night was a little slower. However, I think it is the calm before the storm for this week on Big Brother 16. With the results of the Power of Veto competition yesterday, it looks like it could be a battle of the meatheads for Week 3. The plan has been to backdoor Devin this week, but can they still make that happen? Check out the highlights from the Live Feeds yesterday in our Big Brother 2014 spoilers below! >>>Click here for our Live Recap of Big Brother 2014 Sunday Night!!! Jocasta has been sick with dehydration and heat exhaustion. She did not participate or even attend the Veto Competition. Donny won the veto and immediately went to her and gave it to her, so it looks like he will be taking her off the block. This is where it gets interesting. This will still allow Derrick to put Devin up as the renom and Devin can be voted off this week. (Side note: it would not be a backdoor anymore since Devin competed in the Veto Competition and had a chance to win safety for the week) However, the HGs are thinking and thinking and chatting and chatting some more about keeping Devin over Caleb! Derrick wants Devin gone and keeps bringing everyone back to normal, which he will have to do all week if Devin truly does go home! Team America got started on their mission (get three HGs to spread the rumor that Zach is related to Amanda from BB15). They must tell this rumor to three people, who then must share that info with three other people for it to be legit. Derrick tells Victoria the rumor and that Paola told him before she left. He tells her to run it by Brittany to see if it is true. Donny tells Nicole and she is supposed to run it by Christine to see if it is true. However, this gets Nicole’s brain working and she thinks it is a twist and Donny is America’s Player (this could hurt him), but she did run it by Christine. 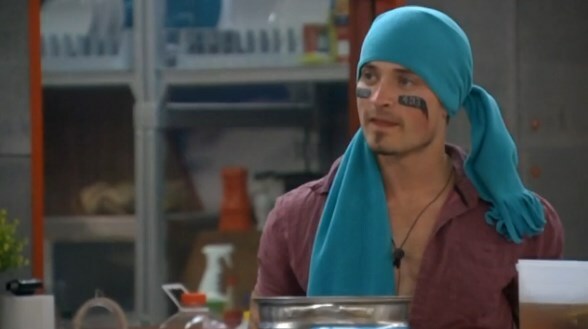 Frankie will be telling Caleb and hope he runs it by Amber, which we all know he will. To be honest, it is going to be a week of flip-flopping between Caleb and Devin (and the Veto Meeting isn’t even until tomorrow)! Donny has been causing some havoc in the house and people are paranoid over him. He is a comp beast and everyone likes him, so he could be a target next week. The men did a hot body contest after the Veto Competition as well, so I am sure CBS will show us and that could be fun to watch! How ’bout this for a non controversial statement: this season is already so much better than last season! If Devin does leave I expect the house to show signs of splitting in two alliances. It’s already starting. We wanted gameplay and we’re getting that!! We certainly can agree on that statement. There has been more game play in the first 2 weeks than most of last year. What irks me though is it’s beginning to seem like the girls are self destructing as usual. I’m not even sure Christine has a shot at this point. I don’t know. I can see Frankie aligning with Christine and Nicole. Kinda depends on which way Hayden ultimately swings. If he goes with my boy Derrick and Zach & Cody (sounds like a Nickelodean or Disney Channel show…). Because Donny will drag Jacosta with him wherever he goes – probably the girls and Frankie. Not so sure about Amber, especially if Caleb goes (she’s just a disappointing timid model at the moment). Brittany is definitely with the girls. I’m just afraid Derrick has a bigger target on his back with the non-machismo side of the house. He’s seen as aligned with what used to be the bomb squad – which may become “the house’s” next target. The good news is things are still fluid and interesting. And (unless BB15), I could find people on both “sides” of the house to root for! The wild card – ironically – could be Donny. Depends on if he can revert to the first 2-week nonentity to the other HGs or if he raises red flags with too many people and becomes the target instead of Caleb!! Surely not…. Derrick has already pulled Victoria in. She thinks they are alligned (they are not). I can see Amber going with the guys since all the girls don’t like her. Hayden….i see him as the wild card. Although he has a crush on Nicole, he is spending a LOT of time with the guys. Maybe to get info? But he does have a mistrust of Christine, so will will have to bide our time to see how that works out. Hayden is definitely this year’s Judd. Nice guy. Can’t decide who to trust. Thought he was smarter than he turned out to be. Decided too late where his loyalties should lie. I like Hayden, but he definitely is one of the potential tilting factors. And I’m not confident he’ll figure things out before it’s too late. Good lord, they need to wake up and just get rid of Devin. They are thinking too much right now. Donny certainly is proving that you don’t have to be muscle bound to win a comp. And i’m not certain that Derrick is actually an ally for Donny. Although he apologized to Donny for the misunderstanding they had, he later told Nicole that Donny was sketchy and winning too many comps. Which only added fuel to the fire of Nicoles paranoia of Donny. Along with that, he told Devin that he believes Donny is actually past military. Now why would he say that to Devin? Devin is leaving (supposedly) and it would not matter. Unless he expects Devin to pass on the info in order to further paint Donny as sketchy. Derrick is back and forth on Donny. Add the fact that Derrick goes to Donny immediately after talking to Devin in the bathroom, and tells Donny that Devin is beginning to campaign and not to listen to it. He’s feigning passing info to Donny so Donny will trust him once again. I’m afraid Donnys days are numbered. What’s up with the military suspicions?!!? Nicole was saying that about Donny to someone (not Derrick) yesterday! Newsflash HGs: Men in the South wear cammo even when they haven’t been in the military!! I wear camo all the time too. It’s cool. I’m from Michigan. We have a lot of hunters. Hunting is cool here as well as other states including the south. Hunters like camo. It’s cool. I think Jocosta should be gone if she can not join in the play. But between the 2 Big guys—-I still hope Devin goes home. Of the other girls–I’m growing tried of Victoria. Definitely. Victoria is too whiney. At least she isn’t fish-braiding her hair 4 times a day anymore! I think if Jacosta’s condition weren’t improving they would have had to do something else. This is her second issue, though. Started with bowel issues, which dehydrated her and caused sun sickness in a comp. I say keep Devin. Maybe it’s me but could someone please show me what shows Devin told, Cody, Derrick, Christine or Amber, be in the Bomb Squad or you’re a target. I have seen people say Devin said stuff or threatened them, when it actually was Derrick lying and Caleb threatening people. Jocasta is a total floater. It’s funny how she got terribly ill after being put on the block. And saying she will not lie while in the house, please! What BB game has she watched? It’s a game of lies, deception and comps. Caleb is scarier then Devin. He always looks like he ready to explode. Victoria is another floater. She wants attention and to be seen. And Derrick is playing way too hard now. Lies are a part of the game but he is telling too many too fast. Brittany needs too keep some info to herself for future use. That’s why Derrick and Cody want to keep her close and she has no poker face at all. Trellagrl, not sure if you’re just watching the CBS shows? But Devin’s very conversations – especially when he was in power – always implied “my way or the highway”. That’s how Zach got in his crosshairs: He had the gall to admit he disagreed with Devin after Devin expressly said the Bomb Squad was a democracy and he wanted their opinions! No one is safe around Devin. Period. If he isn’t gunning for you, he’s talking crap about you. I agree about Britney. She was a recruit. And most recruits struggle with how to play the game in the beginning. Joey is a perfect example. Another recruit that didn’t realize that you don’t develop verbal diarrhea . But Britney is learning. Slowly. But i’m afraid it might be too late since Derrick has decided to keep his enemies close.